Google is most popular search engine and it is always working hard to make web a better place. Google has released so many products and services that make your life better as a web designer, developer and normal internet user. Last year Google released a new design language, Material Design. So many individual designers and developers used Material Design concept to create websites and mobile apps. Many people also released CSS frameworks that lets you create responsive websites and add modern material design feel to your websites. Few weeks ago Google released its own light wight and fast CSS framework Google MDL Lite also known as Google’s Material Design Lite Framework. Have you heard of Twitter’s Bootstrap and Foundation by Zurb, these popular CSS frameworks lets you create modern fully responsive websites quickly and easily. Now you have another modern CSS framework from Google, Most popular search engine. MDL Lite framework is really fast and light weight. This new framework lets you add Material Design look and feel to your websites very easily. You need to add some essential CSS classes to your HTML pages to create fast, fully responsive, mobile friendly websites with Modern design. Google MDL Lite is simple and easy to use framework. Google has also released some sample website Templates built with Material Design Lite framework. You can see all those Template to understand what type of websites you can create and what is Material Design. There are 5 Templates available, Blog, Android.com MDL Skin, Dashboard, Text-Heavy Webpage and Stand Alone article. View all Templates built with MDL Lite fraamework. 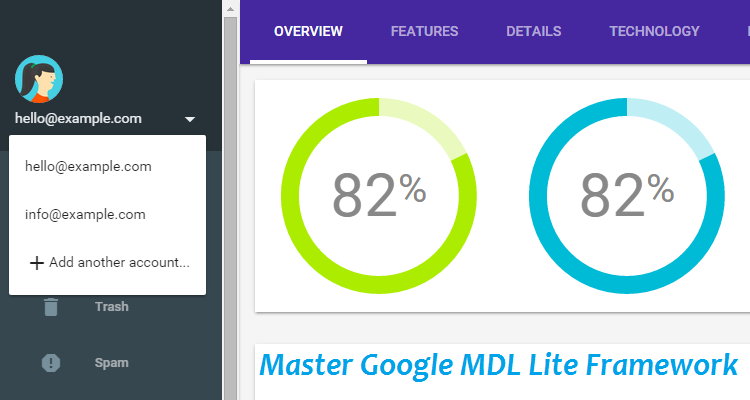 I have created a new udemy course about Googles new MDL Lite framework, after watching this course you will be able to create multi column, fast and mobile friendly websites with Material Design Lite framework. This courses have many step by step MDL Lite tutorial for beginner. I will add advance video tutorials as well. Basic knowledge of HTML and CSS is required to take this course. I have designed this course for anyone who wants to learn how to create mobile friendly fully responsive and fast websites quickly and easily without learning Responsive Web Design from scratch. Remember learning and mastering responsive web design from scratch is not an easy task, you will have to spend several months to learn Responsive Design, tools, media queries and best practices. So What is the best and easy way to create fully responsive and mobile friendly websites. Answer is simple and easy. Start creating Fully responsive websites with in few weeks. I have used this method to create basic and advance multi column responsive websites. I always use Bootstrap, Foundation and MDL Lite framework to co create responsive websites, It’s simple and easy and it saves my time as well. You can master Bootstrap and MDL Lite framework with my udemy courses. I am giving you a chance to learn Bootstrap and MDL Lite Framework quickly and easily. Join my courses now & you can save a lot of money as well. Use coupon codes below and pay only $9 if you want to build responsive websites with Material Design Lite and Bootstrap framework. Good Job after shedding your light on other frameworks, its worthy to join this course. I wonder if you could diffreniate between frameworks in your next write up.